The 2014 Zheng3 Garage Organization drive stampedes forward with this set of PVC pipe hangers. I'm using these to safely store a few of the lovely and talented Mrs. Zheng3's coir baskets until she can transfer them, or, perhaps just as likely, cause them to be moved by some other agent, almost certainly me because our children are both lazy and short, onto their summer stations on the veranda. 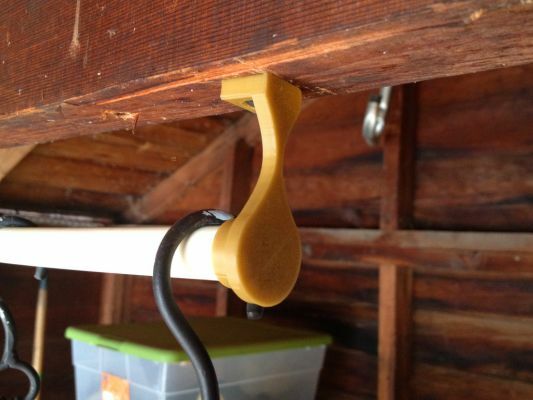 These hangers are designed to fit a 5/8" (16mm) PVC pipe and have a hole and countersink for a drywall screw. Everything's Better With Drywall Screws. Includes a capped end and an open internal hanger. Scaling to fit other diameters of PVC is left as an exercise for the reader. Installation under heavy load or in areas prone to pronounced seismic activity is not recommended.